Howto - CompressWeb -- Enhance your web experience. How to configure Email Questionnaire to send questionnaire and collect responses? EQ works with your existing email system. The correct mail settings is very important for EQ to function correctly. 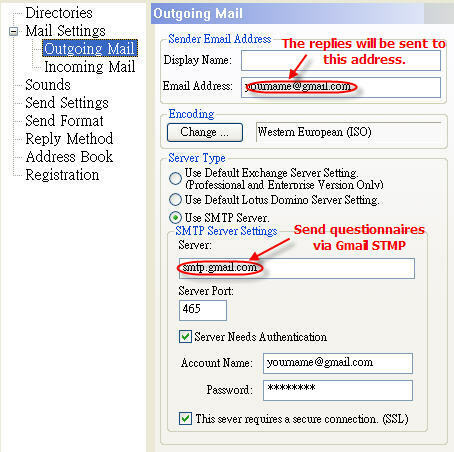 Please follow the instructions below to complete smtp configuration. In Outgoing Mail tab, select "Use SMTP Server". Enter "smtp.gmail.com" as the Server. Enter 465 as the Server Port. Check on the "Server Needs Authentication". Enter your full email address (including @gmail.com or @your_domain.com) and password. Check on the "This server requires a secure connection." Step 2: Make sure that you have enable POP or IMAP in Gmail. Login Gmail with your email account. After that, click "Settings" in the upper-right of the webpage. Then switch to "Forwarding and POP/IMAP" tab to enable POP or IMAP. Please follow the instructions below to complete incoming mail settings. 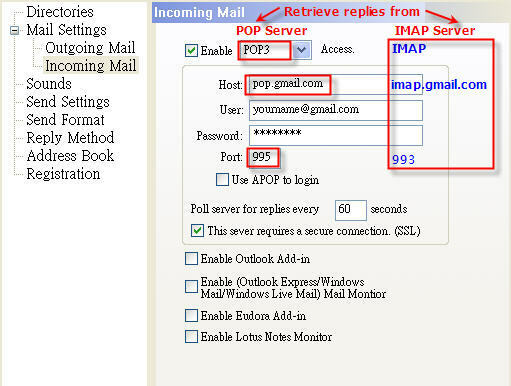 In Incoming Mail tab, only select "Enable POP3/IMAP Access". If POP3 is selected, enter pop.gmail.com as Host and 995 as the Server Port. If IMAP is selected, enter imap.gmail.com as Host and Enter 993 as the Server Port. Enter how often to poll the server for replies, ex. 60 seconds. In Outgoing Mail tab, you can select the default Exchange Server or the SMTP server to send questionnaires. Please follow the instructions below to collect replies. 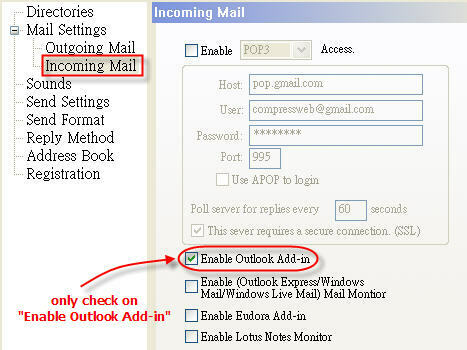 In Incoming Mail tab, check "Enable Outlook Add-in" and disable all other items. Invoke your Outlook and retrieve the emails from the account specified as the "Sender Email Address" (set in Outgoing Mail tab). Outlook "Email Questionnaire" add-in would automatically copy the content of the questionnaire replies into EQ and move them to the deleted folder.